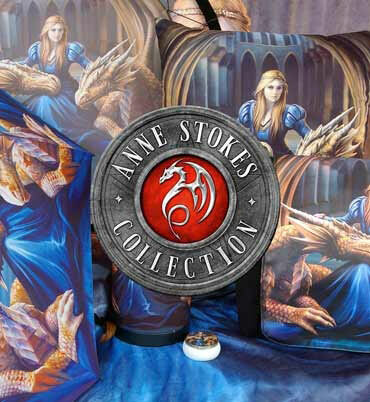 From the imagination of Anne Stokes, this figurine is exclusively available from Nemesis Now. Standing on a rocky platform, this red-haired mage wears a long, white flowing robe over her blue dress, brown gloves coming to her elbows. In her left hand she holds an arcane staff, a red egg-shaped jewel set in the end glowing with magical power. A violet-tinged Dragon curls around her, wings shielding her protectively, while she lifts her other hand to scratch under their chin. Around them, glowing red crystals emerge hesitantly from the rock. Cast in the finest resin before being carefully hand-painted, this beauty would make the perfect addition to any Gothic Fantasy collection.